Does anyone know how to time travel? If so, can you PLEASE teach me so it can be December already. I NEED Sinful Empire. In all honesty, these books keep getting better, I feel like I say that a lot but it's the honest truth. 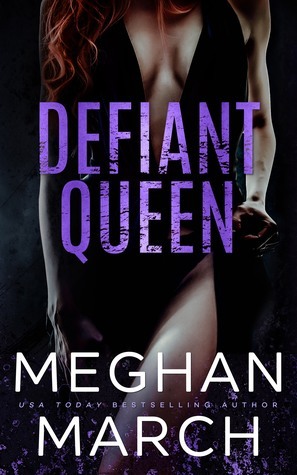 I will admit I was in a bit of a book funk after my last read (American King by Sierra Simone) nothing sounded good, then I looked at my calendar and realized that Defiant Queen was going to sent the next day and WOOT WOOT my funk ended on page one!!! Mount and Kiera's story continues right where Ruthless King ended. You remember that ending right?! I was shocked and didn't know what would happen in book two. I should have known that Mount wouldn't let anything happen to his defiant queen. DQ is just as gripping as RK. The passion between Mount and Kiera is off the charts. The one big difference between book 1 and book 2 is that we get to know Mount a little bit better. We see a different side to him; a bit more real and I LOVED every second of it! The ending to DQ will leave your jaw on the floor and you wanting to learn how to travel in time so you can get your hands on Sinful Empire. My only complaint was it was over to quickly. I need to learn to read slower and savor the words on the pages.